Like all good things, dating sites are not without their costs. But with the right research, you can find the right dating site for any budget. The popular dating site Match.com is completely free to join and offers some competitive membership plans which won’t break the bank. Match.com doesn’t charge you a penny to sign up, so you can delve into the world of online dating without pulling out your credit card. You can create a profile, upload some photos of yourself and browse potential singles - all for free. You can also send and receive “Winks,” a special online dating flirt. Match.com is for anyone looking for a new connection. You can search for a match according to gender, age, location, religion and more. The site serves heterosexual and homosexual singles alike, and is for people looking for all different kinds of relationships. With over 13.5 million visitors per month, you’ll have high chances of finding the one. Most dating sites, like Zoosk and eharmony for example, offer free basic subscriptions that allow you to sign up and start browsing singles. If you do spot someone of interest and want to start chatting, you’ll need to upgrade your subscription. However, Match.com offers a full 7 day trial subscription. That means you can enjoy the site without paying, and that includes checking out its premium features and communication tools. If you’ve tried out your 7-day free trial and are hooked, there are some great plans available with monthly costs as low as $19.99. The cost depends on the length of the subscription plan. Choose from 3-month, 6-month and 12-month subscription plans. The longer the membership, the larger the savings on the per month cost. The 12 month trial is a commitment but it works out best for your buck. Match.com is so confident you’ll meet someone special, that if you don’t meet someone in the first 6 months of sign up, you’ll get the next 6 months for free. For this to be relevant you have to be signed up to Match.com’s Bundle Plan. The plan is only a few more dollars than the standard subscription, but it offers you additional features such as a highlighted profile, first impressions, and a notification if your email has been read. It’s easy to pay subscription costs with Match.com. The dating site accepts most credit cards, prepaid credit cards, Paypal and most checks and money-orders. It’s important to remember that if you successfully find a match on the site, you’ll need to manually discontinue your subscription. If you don't, at the end of your commitment period, your subscription will be automatically renewed. You can turn off your auto-renewal, just visit the Change/Cancel Membership page under your Account Settings. There is currently no option for temporarily suspending your membership, so if you do want to take a break from the site there is an option to hide your profile until you are ready to use the site again. When you subscribe for a membership with Match.com, you’ll be able to communicate with all Match.com singles. You can message back and forth with users who have shown an interest in you or send messages to users who you’ve liked the look of. You’ll get to see who has viewed or favorited your profile and keep count of all your open connections in one place – including those you've sent Winks and Likes to. You can also remove users you’re not interested in to make space for new possibilities. A new feature Match.com has recently rolled out is the ‘Missed Connection’ feature. This new location-based feature on the Match app allows users to see other members they have crossed paths with in real life. This is another meaningful way to try and merge together the online and offline worlds. Match.com has its own matchmaking algorithm to connect you with compatible people based on your personality profile, your match criteria, and your on-site activities such as who you search for, or who you’ve indicated you like. You get 5 matches per day based on the ‘Mutual Match’ search which means you’ve both been looking for similar profiles. For each suggested match you reply, "Yes", "No" or "Maybe". Your answers are recorded and logged with the user's profile, becoming another data point for the algorithm to work with. 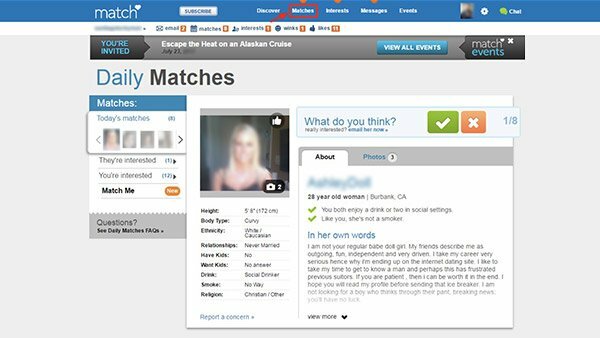 In addition to its smart matching and innovative features, Match.com hosts real-life events, bringing people together both online and offline. With a free trial plan and competitive pricing plans, if you’re looking to meet someone special, it’s worth signing up for Match.com.